The Zapotec civilization (Be'ena'a (Zapotec) "The People" c. 700 BC–1521 AD) was an indigenous pre-Columbian civilization that flourished in the Valley of Oaxaca in Mesoamerica. Archaeological evidence shows that their culture goes back at least 2,500 years. The Zapotec left archaeological evidence at the ancient city of Monte Albán in the form of buildings, ball courts, magnificent tombs and grave goods including finely worked gold jewelry. Monte Albán was one of the first major cities in Mesoamerica and the center of a Zapotec state that dominated much of the territory that today belongs to the Mexican state of Oaxaca. A funerary urn in the shape of a "bat god" or a jaguar, from Oaxaca, dated to AD 300–650. Height: 9.5 in (23 cm). Zapotec civilization originated in the Central Valleys of Oaxaca in the late 6th Century BC. The three valleys were divided between three different-sized societies, separated by 80 square kilometres (31 sq mi) “no-man’s-land” in the middle, today occupied by the city of Oaxaca. Archaeological evidence, such as burned temples and sacrificed captives, suggests that the three societies competed against each other. At the end of the Rosario phase (700–500 BC), the valley's largest settlement San José Mogote, and a nearby settlement in the Etla valley, lost most of their population. During the same period, a new large settlement emerged in the “no-man’s-land” on top of a mountain overlooking the three valleys, that was called Monte Albán. Early Monte Albán pottery is similar to pottery from San José Mogote, which suggests that Monte Albán was populated by the people who left San José Mogote. Although there is no direct evidence in the early phases of Monte Albán's history, walls and fortifications around the site during the archaeological phase Monte Alban 2 (ca. 100 BC–200 AD) suggest that the city was constructed in response to a military threat. Archaeologists Joyce Marcus and Kent V. Flannery liken this process to what happened in ancient Greece - (synoikism): a centralization of smaller dispersed populations congregated in a central city to meet an external threat. The Zapotec state formed at Monte Albán began to expand during the late Monte Alban 1 phase (400–100 BC) and throughout the Monte Alban 2 phase (100 BC – AD 200). During Monte Alban 1c (roughly 200 BC) to Monte Alban 2 (200 BC – AD 100), Zapotec rulers seized control of the provinces outside the valley of Oaxaca because none of the surrounding provinces could compete with the valley of Oaxaca politically and militarily. By 200 AD, the Zapotecs had extended their influence, from Quiotepec in the North to Ocelotepec and Chiltepec in the South. Monte Albán had become the largest city in what are today the southern Mexican highlands, and retained this status until approximately 700 AD. The expansion of the Zapotec empire peaked during the Monte Alban 2 phase. Zapotecs conquered or colonized settlements far beyond The Valley of Oaxaca. Most notably, this expansion is visible in the sudden change of ceramics found in regions outside the valley. These region's own unique styles were suddenly replaced with Zapotec style pottery, indicating their integration into the Zapotec empire. Archaeologist Alfonso Caso, one of the first to do excavations in Monte Albán, argued that a building on the main plaza of Monte Albán is further evidence for the dramatic expansion of the Zapotec state. What today is called Building J is shaped like an arrowhead and displays more than 40 carved stones with hieroglyphic writing. Archaeologists interpreted the glyphs to represent the provinces controlled by the Zapotecs. Each glyph group also depicts a head with an elaborate head dress carved into the slabs. These are assumed to illustrate the rulers of the provinces. Heads turned upside down are believed to represent the rulers of those provinces taken by force, while the upright ones may represent those who did not resist colonization and had their lives spared. For this reason, Building J is also called “The Conquest Slab”. Marcus and Flannery write about the subsequent dramatic expansion of the Monte Albán state: "a great disparity in populations between the core of a state and its periphery, it may only be necessary for the former to send colonists to the latter. Small polities, seeing that resistance would be futile, may accept a face-saving offer. Larger polities unwilling to lose their autonomy may have to be subdued militarily. During the expansion of Monte Alban 2 state, we think we see both colonization and conquest". The name Zapotec is an exonym coming from Nahuatl tzapotēcah (singular tzapotēcatl), which means "inhabitants of the place of sapote". The Zapotec referred to themselves by some variant of the term Be'ena'a[pronunciation? ], which means "The Cloud People". The Zapotec languages belong to a language family called Oto-manguean, an ancient family of Mesoamerican languages. It is estimated that today's Oto-manguean languages branched off from a common root at around 1500 BC. The Manguean languages probably split off first, followed by the Oto-pamean branch while the divergence of Mixtecan and Zapotecan languages happened later still. The Zapotecan group includes the Zapotec languages and the closely related Chatino. Zapotec languages are spoken in parts of the Northern Sierra, the Central Valleys as well as in parts of the Southern Sierra, in the Isthmus of Tehuantepec and along parts of the Pacific Coast. Due to decades of out-migration, Zapotec is also spoken in parts of Mexico City and Los Angeles, CA. There are 7 distinct Zapotec languages and over 100 dialects. Zapotec is a tone language, which means that the meaning of a word is often determined by voice pitch (tonemes), essential for understanding the meaning of different words. The Zapotec languages features up to 4 distinct tonemes: high, low, rising and falling. Between Monte Alban phases 1 and 2 there was a considerable expansion of the population of the Valley of Oaxaca. As the population grew, so did the degree of social differentiation, the centralization of political power, and ceremonial activity. During Monte Alban 1-2 the valley appears to have been fragmented into several independent states, as manifested in regional centers of power. Looking over the site of Monte Alban. Situated on a mountaintop, Monte Alban overlooks much of the Valley of Oaxaca. The Central Valleys of Oaxaca, the cradle of Zapotec civilization, are three broad valleys—Etla in the west, Ocotlán in the south and Mitla in the east—that join at an altitude of about 4500 feet above sea level in the center of what today is the state of Oaxaca. They are located about 200 km south of Mexico City. Mountains surround the valley with The Sierra Norte in the north and the mountains of Tlacolula in the southeast. The environment is well suited for agriculture and is considered one of the cradles of maize. It is estimated that at the time of the emergence of Zapotec civilization, the valley soil were unaffected by the erosion seen today, as the oak and pine forests covering the surrounding mountains had not yet been decimated by logging. There is a dry season from November until May but along the rivers it is possible to plant and harvest crops twice a year. The valleys of Etla and Ocotlán are traversed from north-west to south by the Atoyac River which provides water for a small strip of land bordering the river, when it periodically floods. To provide water for crops elsewhere in the valley away from the river, the Zapotecs used canal irrigation. By using water from small streams, the Zapotecs were able to bring water to Monte Albán, situated 400 meters above the valley floor. Archaeologists found remains of a small irrigation system consisting of a dam and a canal on the south-eastern flank of the mountain. As this would not have been enough to support all the population of Monte Albán, it is assumed that there were many other irrigation systems. Likewise, crops grown in the valley were not enough to sustain the rapid population growth in the Monte Albán I phase. Therefore, crops were grown on the foothills where the soil is a less fertile and artificial irrigation was needed. Innovation of farming enabled the Zapotec to pay tribute to the Spanish conquerors and create enough surplus to feed themselves despite natural disasters and disease. The Zapotecs developed a calendar and a logosyllabic system of writing that used a separate glyph to represent each of the syllables of the language. This writing system is thought to be one of the first writing systems of Mesoamerica and a predecessor of those developed by the Maya, Mixtec and Aztec civilizations. There is debate as to whether Olmec symbols, dated to 650 BC, are actually a form of writing preceding the oldest Zapotec writing dated to about 500 BC. In the Aztec capital of Tenochtitlan, there were Zapotec and Mixtec artisans who fashioned jewelry for the Aztec rulers (tlatoanis), including Moctezuma II. However, relations with central Mexico go back much further, as suggested by the archaeological remains of a Zapotec neighborhood within Teotihuacan and a Teotihuacan style "guest house" in Monte Albán. Other important pre-Columbian Zapotec sites include Lambityeco, Dainzu, Mitla, Yagul, San José Mogote, El Palmillo and Zaachila. The Zapotecs were a sedentary culture living in villages and towns, in houses constructed with stone and mortar. They recorded the principal events in their history by means of hieroglyphics, and in warfare they made use of a cotton armour. The well-known ruins of Mitla have been attributed to them. At Monte Albán archaeologists have found extended text in a glyphic script. Some signs can be recognized as calendar information but the script as such remains undeciphered. Read in columns from top to bottom, its execution is somewhat cruder than that of the later Classic Maya and this has led epigraphers to believe that the script was also less phonetic than the largely syllabic Mayan script. The earliest known artifact with Zapotec writing is a Danzante ("dancer") stone, officially known as Monument 3, found in San Jose Mogote, Oaxaca. It has a relief of what appears to be a dead and bloodied captive with two glyphic signs between his legs, possibly his name. First dated to 500–600 BC, this was initially considered the earliest writing in Mesoamerica. However, doubts have been expressed as to this dating as the monument may have been reused. The Zapotec script appears to have gone out of use in the late Classic period. Painted ceramic funerary urn depicting a seated figure. Zapotec culture (phase Monte Albán III), Early and Middle Classic Period (100-700 AD). Mexico. Like most Mesoamerican religious systems, the Zapotec religion was polytheistic. Some known deities were Cocijo, the rain god (similar to the Aztec god Tlaloc); Coquihani, the god of light; and Pitao Cozobi, the god of maize. 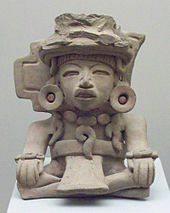 Zapotec deities were predominantly associated with fertility or agriculture. Both male and female deities are represented, differentiated by costume. Males are depicted wearing breechclouts with or without capes, while females are depicted wearing skirts. There is some evidence of worship of deities not directly associated with Zapotec culture, such as the Teotihuacan Feathered Serpent, Butterfly God, and rain god; and the Nahuatl god of spring Xipe Totec. It is believed that the Zapotec used human sacrifice in some of their rituals. There are several legends of the origin of the Zapotec. One of them is that they were the original people of the valley of Oaxaca and were born from rocks, or descended from big cats such as pumas, jaguars and ocelots. Another is that the Zapotec settled in the Oaxaca valley after founding the Toltec empire, and were descendants of the people of Chicomoztoc. These legends were not transcribed until after the Spanish conquest. According to historical and contemporary Zapotec legends, their ancestors emerged from the earth, from caves, or turned into people from trees or jaguars. Their governing elite believed that they descended from supernatural beings who lived among the clouds, and that upon death they would return to the clouds. The name by which Zapotecs are known today results from this belief. The Zapotecs of the Central Valleys call themselves "Be'ena' Za'a" - The Cloud People. The Zapotec used dedication rituals to sanctify their living spaces and structures. Excavation of Mound III at the Cuilapan Temple Pyramid in Oaxaca revealed a dedication cache containing many jade beads, two jade earspools, three obsidian blades, shells, stones, a pearl, and small animal bones, likely from birds, dated to 700 AD. Each of these materials symbolized different religious concepts. As it was not easily attainable, jade was valued, and worked jade even more so because the elite were the primary artists. Obsidian blades are associated with sacrifice, as they were commonly used in bloodletting rituals. Shells and pearl represent the underworld, being from the ocean, and the small bird bones represent the sky and its relation to the balanced cosmos. These artifacts are significant due to their placement in a structure used for ritual and associated with power. This cache is a form of dedication ritual, dedicating the Cuilapan Temple Pyramid to these ideas of power, sacrifice, and the relationship between underworld and cosmos. The last battle between the Aztecs and the Zapotecs occurred between 1497 and 1502, under the Aztec ruler Ahuizotl. At the time of Spanish conquest of Mexico, when news arrived that the Aztecs were defeated by the Spaniards, King Cosijoeza ordered his people not to confront the Spaniards so they would avoid the same fate. They were defeated by the Spaniards only after several campaigns between 1522 and 1527. However, uprisings against colonial authorities occurred in 1550, 1560 and 1715. ^ González, Roberto J.. Zapotec Science : Farming and Food in the Northern Sierra of Oaxaca, University of Texas Press, 2001. ProQuest Ebook Central, https://ebookcentral-proquest-com.ezproxy1.lib.asu.edu/lib/asulib-ebooks/detail.action?docID=3443095. ^ Marcus, Joyce (1978) “Archaeology and Religion: A Comparison of the Zapotec and Maya.” World Archaeology 10(2): 172-191. Marcus, Joyce; Flannery, Kent V. (1996). Zapotec Civilization: How Urban Society Evolved in Mexico's Oaxaca Valley. New aspects of antiquity series. New York: Thames & Hudson. ISBN 0-500-05078-3. OCLC 34409496. Marcus, Joyce; Flannery, Kent V. (2000). "Cultural Evolution in Oaxaca: The Origins of the Zapotec and Mixtec Civilizations". In Richard E.W. Adams; Murdo J. Macleod (eds.). The Cambridge History of the Native Peoples of the Americas, Vol. II: Mesoamerica, part 1. Cambridge, UK: Cambridge University Press. pp. 358–406. ISBN 0-521-35165-0. OCLC 33359444. Whitecotton, Joseph W. (1990). Zapotec Elite Ethnohistory: Pictorial Genealogies from Eastern Oaxaca. Vanderbilt University publications in anthropology, no. 39. Nashville, Tennessee: Vanderbilt University. ISBN 0-935462-30-9. OCLC 23095346. Whitecotton, Joseph W. (1977). 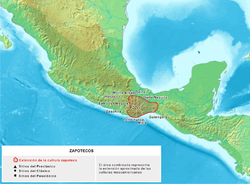 The Zapotecs: Princes, Priests and Peasants. Norman: University of Oklahoma Press. Zeitlin, Robert N. (2000). "Review: Two Perspectives on the Rise of Civilization in Mesoamerica's Oaxaca Valley. Review of: Ancient Oaxaca: The Monte Albán State by Richard E. Blanton ; Gary M. Feinman ; Stephen A. Kowalewski ; Linda M. Nicholas". Latin American Antiquity. 11 (1): 87–89. doi:10.2307/1571672. JSTOR 1571672. Gonzalez, Roberto J. (2001). Zapotec Science: Farming and Food in the Northern Sierra of Oaxaca. University of Texas press.